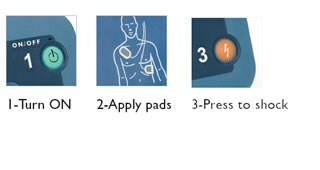 How the Defibrillator is supplied: Battery (one, pre-installed), SMART Pads II (one set, pre-installed), Set up / Maintenance guide with expiration date tags, Owner's Manual, Quick Reference Guide. 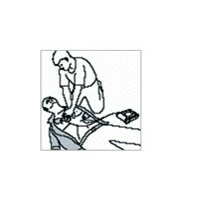 CPR Coaching Voice coaching for adult and infant/child CPR provides instructions and audio cues for the appropriate number, rate and depth of chest compressions, as well as for each breath. Controls Green On/Off button, blue i-button, orange Shock button, optional Infant/Child key. Indicators Ready light, blue i-button, caution light, illuminated pads, icons, Shock button lights up when shock is advised. Standby:meets MILSTD 810F Fig.514.5C-18,swept sine. 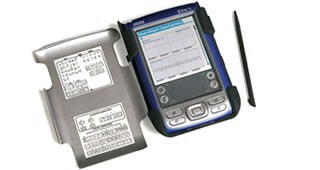 Patient Analysis Evaluates patient ECG to determine if a rhythm is shockable. Rhythms considered shockable are ventricular fibrillation (VF), and certain ventricular tachy-cardias (VT) associated with lack of circulation. For safety reasons, some VT rhythms associated with circulation will not be interpreted as shockable, and some very low-amplitude or low-frequency rhythms will not be interpreted as shockable VF. 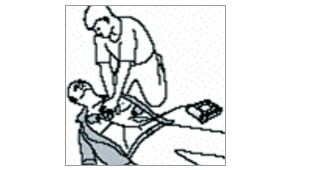 Sensitivity / Specificity Meets AAMI DF80 guidelines and AHA recommendations for adult defibrillation (Circulation 1997;95:1677-1682). 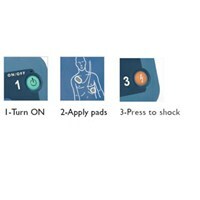 Shock Advised Able to deliver a shock as soon as the device indicates a shock is advised. Artifact Detection Advanced signal processing allows accurate ECG analysis even in the presence of most pacemaker artifact and electrical noise sources. Other artifacts are detected and corrective voice prompts issued. Type 9 Volt DC, 4.2 Ah,lithium manganese dioxide, disposable long-life primary cell. 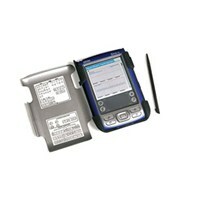 Capacity Minimum 200 shocks or 4 hours of operating time (EN 60601-2-4:2003). Install-by Date Battery is labeled with an install-by date of at least five years from date of manufacture. Standby Life Four years typical when battery is installed by the install by date. 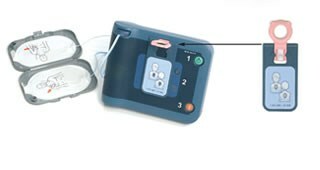 (Will power the AED in standby state within the specified standby temperature range, assuming one battery insertion test and no uses. 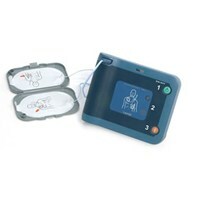 How Supplied Disposable pads case containing adhesive multifunction defibrillator pads.HeartStart plug style connector clicks into device for preconnected pads solution. Use-by Date Pads case is labeled with a use-by date of at least two years from date of manufacture. 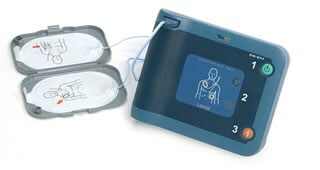 Function Special pads place HeartStart FRx into training mode and disable its energy delivery capability. Features 8 real-world training scenarios. Self-tests Tests internal circuitry,waveform delivery system,pads and battery capacity. Status Indicator Blinking green "Ready" light indicates ready for use. 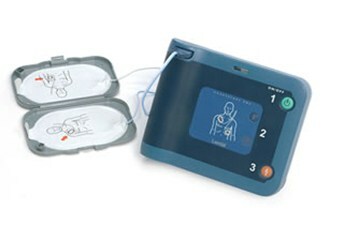 Infrared Wireless transmission of event data to a PC or Palm® PDA, using the IrDA protocol..
HeartStart Event Review Software Data management software (optional) for download and review of data retrieved through defibrillator’s infrared data port. 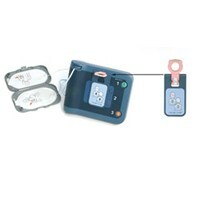 Data Stored Stores first 15 minutes of ECG and the entire incident’s events and analysis decisions.